I had to think about this one for a bit before I decided to use it for a forgotten book. I devoured these books as fast as they came out and never realized they were by someone other than a fellow named Nick Carter. Hey, I was about fifteen when they started. The Nick Carter, Killmaster series ran from 1964 into 1990, 261 novels by various writers under the Carter house name. 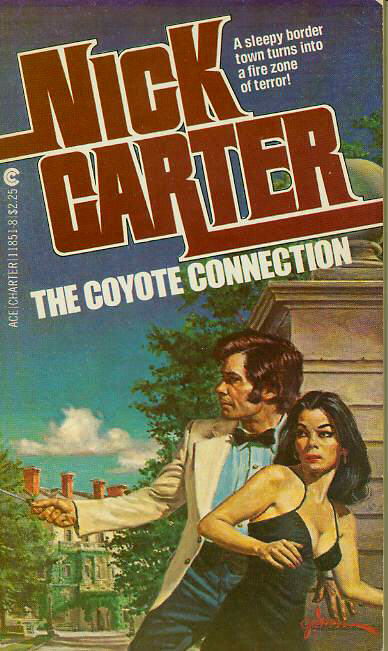 THE COYOTE CONNECTION was by Bill Crider and Jack Davis and was number 144 in the series. Here, in a stroll down memory lane, he talks about it among other things.I don’t think I missed a single volume. After that, I sold them to a new/used book dealer in town, a decision I later regretted. Still, I made a good friend over it, he buying the entire set the same day I sold them to the lady and wanted to talk to me. She called and asked if it would be alright to give him my number. Yes, and we were friends for a long while until cancer took him. Just how naive I was about NIck Carter was that I had no idea thw whole time of the extensive history of the character and all it’s permutations. I’m a little better informed these days. Thank heaven for the internet. Nick Carter, N3 of AXE, is on vacation in Texas recovering from wounds received in a previous operation. Like all good agents, that meant finding and entertaining a lovely lady as only our hero can. He’s interrupted by a phone call from his boss, David Hawk, pulling him back to work. Word had come of a team of terrorist in Mexico planing to cross the border in Texas. Their plan was to spread out and assassinate twenty members of Congress in their home states. N3’s assignment is to find them and “take” care of the problem. He soon latches onto a possible connection in one of the coyotes, those who ferry Mexicans across the border for a fee, and moves in, learning there’s a little more going on than David Hawk knew about. A nicely entertaining novel with fights, bedding women, and Nick moving fast as he develops the full picture of what’s happening and how he will deal with it. I must admit the ending was a shocker, though I knew it had to end like it did. A nice revisit to my younger days. For more forgotten books, check out Patti Abbott at her blog, Pattinase. A great pick! And isn’t that a cool cover? I never even saw these back then, let along read any. I may check and see if there are any inexpensive copies floating around. ONE can’t hurt, after all. . . The Destroyer series was the only one of this type of series that I ever read consistently, but I devoured those. I loved the Nick Carter and started reading them around 1967, pretty early in the run. It was easy to catch up. By the time this one came out I knew that various people were writing them and was already friends with Bill. I still remember getting the letter from him telling me that the book had sold. A fine book it is, too, one of the best in the series. “Nick Carter series” that should say in the first line. It’s too early in the morning for me to be commenting. Really enjoyed the review Randy though this is not a series I ever dipped into (not sure they were easily available in the UK). Thanks for the link to the interview with Bill Crider as I had no idea he contributed to these. Amazing to think that the original iteration (sic) of ‘Nick Carter’ began as a an actual Victorian contemporary of Sherlock Holmes!